Such services can appeal to shoppers who aren’t prepared to wait a few days for delivery, or who cannot be around to receive their orders at home due to work or other commitments. sell additional items to these customers. Halfords launched its reserve and collect service in conjunction with Salmon last year, and the investment looks to have paid off in terms of driving offline sales, with multi-channel revenues having grown by 90% in the year to April 2009. Argos has had similar success with its multichannel approach, and its ‘Click and Reserve’ service was responsible for 17% of all sales in the year ending February 2009, growing by 45%. This suggests that, though multichannel integration can be highly challenging for retailers, as joining up online and offline to provide accurate information on stock levels requires a lot of effort, such investments can drive significant numbers of offline sales. Indeed, as Martin Newman pointed out in this post on multichannel retail last year, for every sale the web generates online, it pushes three in store. Beyond offering reserve and collect services, retailers need to ensure that customer experience is joined up across channels. For instance, customers expect the option of returning or exchanging items at their local store, whether they were purchased online or offline. I have been in stores where customers were told they could not accept returns because they were bought on the web, and this lack of integration can create a very poor impression of the brand. online and purchased instore, or if additional items are sold in store as a result. budgets should be spent online. For more on multichannel retail, this post has 13 recommendations for multichannel intregration, while here are some tips on providing effective reserve and collect services. The ongoing economic crisis has done much to change the futures and perceptions of many industries. The advertising sector is one that many prognosticators have deemed forever changed. Ad dollars lost over the last two years are not ever coming back, they say. But a new study has found a widespread optimism has returned to advertising, with many executives expecting dollars and budgets to increase in the coming months. 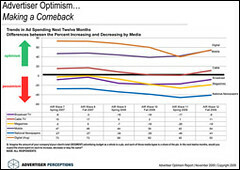 According to Advertiser Perceptions Inc., optimism among ad executives is the highest it’s been in two years, and ad spending plans are trending upward for most major media. If those plans come to fruition, advertisers will have a lot to be thankful for as November and 2009 come to an end. Publishers could be missing out when it comes to international visitors to their sites, with only 17% of revenue coming from overseas visits, despite international traffic accounting for 28% of visits. This is one of the findings from the Econsultancy’s Online Publishers Survey Report, produced in association with the Rubicon Project.